Pressure ulcers, also known as decubitus ulcers or bedsores, are localized injuries to the skin and/or underlying tissue usually over a bony prominence, as a result of pressure, or pressure in combination with shear and/or friction. Most commonly they are found on the sacrum, coccyx, heels or the hips, but other sites such as the elbows, knees, ankles, or the back of the cranium can be affected. They range in severity from mild (minor skin reddening) to severe (deep craters down to muscle and bone). What causes a pressure ulcer to develop? Pressure ulcers occur when soft tissues are distorted in a fixed manner over a period of time. This distortion usually occurs when the soft tissues are compressed and/or sheared between the skeleton and a supportive device (such as a bed or chair). This causes the blood vessels within the distorted tissue to become compressed, angulated, or stretched out of their usual shape. As a result, blood is unable to pass through the vessels. When blood is unable to pass through the vessels, the distorted tissues become ischemic. Ischemia is the shortage of oxygen and nutrients needed to keep tissue alive. If ischemia occurs for an extended length of time, then death of the tissue occurs, a process known as necrosis. Other factors cause pressure ulcers, too. If a person slides down in the bed or chair, blood vessels can stretch or bend and cause pressure ulcers. Even slight rubbing or friction on the skin may cause minor pressure ulcers. How does the failure to comply with the standard of care cause severe pressure ulcers? The standards of care discussed above related to preventing pressure ulcers all focus on identifying those at risk for the development of pressure ulcers and providing the interventions necessary to prevent the development of the ulcers. When a facility or its nurses fail to have, enforce, or enact the appropriate measures to assess a person's risk for developing a pressure ulcer, then the person does not receive the necessary care to prevent the development of ulcers. When a facility or its nurses fail to have, enforce, or enact the appropriate interventions to prevent the development of ulcers, then the patient or resident is more likely than not going to develop ulcers. Nonblanchable erythema of intact skin, the heralding lesion of skin ulceration. In individuals with darker skin, discoloration of the skin, warmth, edema, induration, or hardness may also be indicators. A Stage I pressure ulcer is an observable pressure related alteration of intact skin whose indicators as compared to the adjacent or opposite area on the body may include changes in one or more of the following: •skin temperature (warmth or coolness), tissue consistency (firm or boggy feel) and/or sensation (pain, itching).• The ulcer appears as a defined area of persistent redness in lightly pigmented skin, whereas in darker skin tones, the ulcer may appear with persistent red, blue, or purple hues. Partial thickness skin loss involving epidermis, dermis, or both. The ulcer is superficial and presents clinically as an abrasion, blister, or shallow crater. Full thickness skin loss involving damage to or necrosis of subcutaneous tissue that may extend down to, but not through, underlying fascia. The ulcer presents clinically as a deep crater with or without undermining of adjacent tissue. Full thickness skin loss with extensive destruction, tissue necrosis, or damage to muscle, bone, or supporting structures (e.g., tendon, joint capsule). Undermining and sinus tracts also may be associated with Stage 4 pressure ulcers. Full thickness tissue loss in which the base of the ulcer is completely covered by slough (yellow, tan, gray, green or brown) and/or eschar (tan/brown or black) in the wound bed. Until enough slough and/or eschar is removed to expose the base of the wound, the true depth and stage cannot be determined. However, it will be either a Stage III or Stage IV. Purple or maroon localized area of discolored intact skin or blood-filled blister due to damage of underlying soft tissue from pressure and/or shear. The area may be preceded by tissue that is painful, firm, mushy, boggy, warmer or cooler as compared to adjacent tissue. Deep tissue injury may be difficult to detect in individuals with dark skin tones. Evolution may include a thin blister over a dark wound bed. The wound may further evolve and become covered by thin eschar. Evolution may be rapid exposing additional layers of tissue even with optimal treatment. The standards of care related to treatment are intended to prevent ulcers from progressing from a Stage I or Stage II wound to a Stage III or Stage IV wound. When insufficient care is provided to treat ulcers and the ulcer progresses to a Stage III or a Stage IV wound, then the patient or resident suffers a number of complications directly caused by the failure to assess, prevent, and treat ulcers. How do severe pressure ulcers impact residents and patients? First, and most obviously, Stage III, Stage IV, and unstageable pressure ulcers impact the skin. These ulcers cause skin loss with extensive destruction, tissue necrosis, and damage to muscle, bone, tendons, and other supporting structures. When an ulcer is classified as unstageable, it means that the ulcer is at least a Stage III or Stage IV, but the ulcer is heavily covered in necrotic tissue, preventing health care providers from seeing how deep the injury extends under the skin. Second, patients and residents who have severe ulcers have an increased morbidity and mortality rate. Third, patients and residents who have severe ulcers become susceptible to infection and other medical complications related to the wound and its treatment. Fourth, the patients and residents who develop severe ulcers have problems with pain and loss of dignity associated with the wound and its treatment. Christopher M. Davey, MD, CWSP, trained as a Pathologist at Mount Sinai Medical Center in Miami, Florida. since 1987. 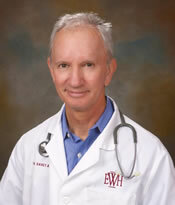 Dr. Davey has practiced in Family and Geriatric Medicine in office, hospital, and nursing home settings. He is Board certified by the American Academy of Wound Management as a Certified Wound Specialist (CWS) and is a trained Hyperbaric Specialist.